LONDON, England -- UEFA has opened legal proceedings against a Cypriot FA official who has alleged that the decision to make Ukraine and Poland joint hosts of Euro 2012 was rigged by payments of more than €9.15m (£8m) to at least four members of the European governing body's Executive Committee (ExCo) who voted on the matter in 2007. 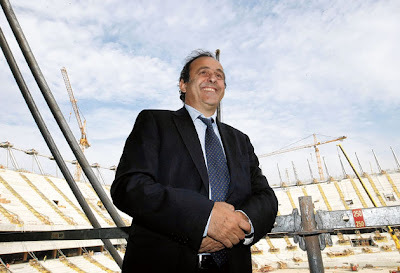 The president of UEFA, Michel Platini, visits the half-built National Stadium in Warsaw two weeks ago. He is following the story 'very closely'. Uefa had set Spyros Marangos, a former board member of the Cypriot FA, a deadline of Wednesday to provide evidence to support his claims. He failed to do so, and with Cypriot sources saying the claims are nothing more than a mischievous ploy in a local power struggle, UEFA has started legal action on two fronts: a defamation action, and what is effectively a "put up or shut up" action to force Marangos to provide evidence. "We are in the process of opening legal proceedings against him to protect the corporate image of UEFA and also to force his hand to show us what evidence he has," said a UEFA spokesman, Rob Faulkner. "He said it was too short notice for him to travel to Switzerland [by Wednesday] and he wanted us to go there [to Cyprus]." Two European newspapers, Sueddeutsche Zeitung in Germany and Gazzetta dello Sport in Italy, have run articles this week giving more detail of Marangos's claims, including that some of the cash allegedly paid to corrupt officials was stuffed inside teddy bears for the handovers, on Cypriot soil. There are 15 members of UEFA's ExCo, and 12 of them voted on the hosts for 2012, the others being excluded because their nations were involved in bids. Italy were the pre-vote favourites to win, and another bid, jointly from Croatia and Hungary, was also in the running. But Poland-Ukraine emerged the winners, 8-4 over Italy. Polish and Ukrainian officials have described the allegations as "slander" while reaction elsewhere has alternated between scepticism about Marangos and a desire for a full investigation into the claims. Marangos says he attempted to turn whistle-blower at various points over the past few years by writing to UEFA officials with his allegations, but that UEFA had not taken him seriously. An Italian government official – Rocco Crimi, who is a cabinet undersecretary and sports delegate – yesterday entered the fray by calling for an Italian judicial investigation into the allegations that his nation had effectively been robbed of hosting the tournament. Crimi said Italy's judicial authorities should intervene and that "if crimes emerge they should be prosecuted". He added that Italy would be ready to host Euro 2012 if needed, although there is no suggestion from any party that the tournament will be staged anywhere but Ukraine-Poland. Separate concerns earlier this year that those countries would not be ready have now been dismissed. The Italian Football Federation president, Giancarlo Abete, says he has full confidence in UEFA to deal with the issue. "UEFA have opened an investigation and there's the will and the need to have clarity," Abete said. "[UEFA's president] Michel Platini is following the issue of Euro 2012 closely and we have full confidence that there will be clarity in this situation. "As a member of the executive committee of UEFA, I had been informed of the request made by the Cypriot treasurer with problems relating to Euro 2012. Now we hope that the solution to this ugly story arrives quickly. Certainly, if it's not possible to verify or prove his accusations, it's right that the Cypriot should be prosecuted for the doubts he has raised." Gazzetta ran the alleged bribes story on its front page yesterday under a headline saying "Corrupt", and detailed that Marangos had claimed one ExCo member received a bung of €3.15m (£2.75m) for his vote, while three others received £1.75m each, and a fifth member received an unspecified inducement to vote for the eventual winners. "I have three documents, but it only takes one to open the case," Marangos was quoted as saying. "I'm ready to give all the information, but only here [in Cyprus] and in the presence of a public authority of Cyprus." Marangos claimed in Gazzetta that revealing the documents to anyone but authorities who could act on them could endanger the lives of witnesses, as well as his own family and other contacts. "I want there to be justice," Gazzetta quote Marangos as saying over the airing of his claims. "Euro 2012 should be reassigned to Italy." Gazzetta has also published correspondence purportedly from Marangos to UEFA officials over a two-year period, including a fax sent directly to Platini in June 2009, and a letter sent to UEFA's well-regarded head of discipline and compliance, Peter Limacher, in July this year. Marangos says Limacher was meant to meet him but that meeting was cancelled. Limacher is currently suspended pending a UEFA investigation into unsubstantiated claims he was the source of a story in a German magazine alleging match-fixing against Bayern Munich. On 8 November 2005, UEFA's Executive Committee whittled down prospective bids for Euro 2012 from five to three, eliminating Turkey and Greece from the process. At this stage, Ukraine-Poland was in third place behind the bids from Italy and Hungary-Croatia. Below is how ExCo members voted then, but when the decision was made in Cardiff on 18 April 2007, they had changed their minds. The Italians were the clear favourites ahead of the final vote. Led by Luca Pancalli, the Football Federation's commissioner, their bid was by far the best on paper, as the country had already hosted the competition twice, in 1968 and 1980, and had the best stadiums. However, Roma fans' attacks on Manchester United supporters just days before the announcement in 2007 were blamed for Uefa overlooking them. The violence in Italy coupled with the Serie A match-rigging scandal of the previous season gave Hungary and Croatia hope they could prevail, as they had won the second biggest number of votes in the initial phase. When they too were overlooked, there was outrage with Croatian FA president, Vlatko Markovic, demanding compensation from Uefa. Despite trailing in third after the 2005 vote, Ukraine-Poland's bid presentation in Cardiff impressed UEFA. It was fronted by Andrei Shevchenko and Jerzey Dudek, then of Chelsea and Liverpool respectively. What reportedly swung the vote was Uefa president Michel Platini's desire to end western Europe's hegemony of hosting the competition.